Bowflex home gyms utilize light weight rods and bands to provide resistance. This can make them reasonably safer than a standard free weight gym or other heavy pieces of weight lifting equipment, which accounted for the majority of weight lifting injuries between 1990 and 2007, according to "The New York Times." However, your Bowflex home gym may have limits in terms of what types of workouts it can provide. As a tool for general conditioning, the Bowflex gym can be a sufficient piece of exercise equipment. The variety of exercises and freedom of motion achievable on a Bowflex home gym are its strengths, particularly for beginners. To utilize the machine's versatility, you may want to try the 20-minute better body workout provided in your Bowflex manual. This routine has you perform a full-body workout three times per week. You need to select one or two exercises for each major muscle group in your body, and then perform that exercise for one to two sets of 10 to 15 repetitions. Choose exercises like the seated lat row, rear deltoid row, lying triceps extension, biceps curl, low back extension, abdominal crunch, bench press, leg extension and leg curl. Bowflex recommends 30 to 45 seconds of rest between sets. If your main goal is to lose weight with the Bowflex, the best workout for you is the Bowflex body leanness program. This is a comprehensive program designed by physical fitness trainer Ellington Darden, Ph.D., who suggests that you focus on large muscle groups like your legs, chest and back. Perform the exercises for a single set of eight to 12 repetitions, increasing the resistance as you become stronger. Begin your first week with the leg curl, leg extension, bench press, biceps curl, seated shoulder press and seated abdominal crunch exercises. At week three, add the triceps extension and rear deltoid row exercises; and at week five add the reverse fly and lying shoulder pullover to the routine. Combined with a calorie restricted diet, Darden claims the Bowflex body leanness program can yield significant weight loss results. Some Bowflex home gyms only provide a maximum of 210 lbs. of resistance, but other models -- like the Bowflex Revolution -- have up to 600 lbs. available through upgrades. With the heavy-duty Bowflex models, you can engage in a muscle building program like the bodybuilding routine. With this workout, exercise three days consecutively, followed by one day of rest. 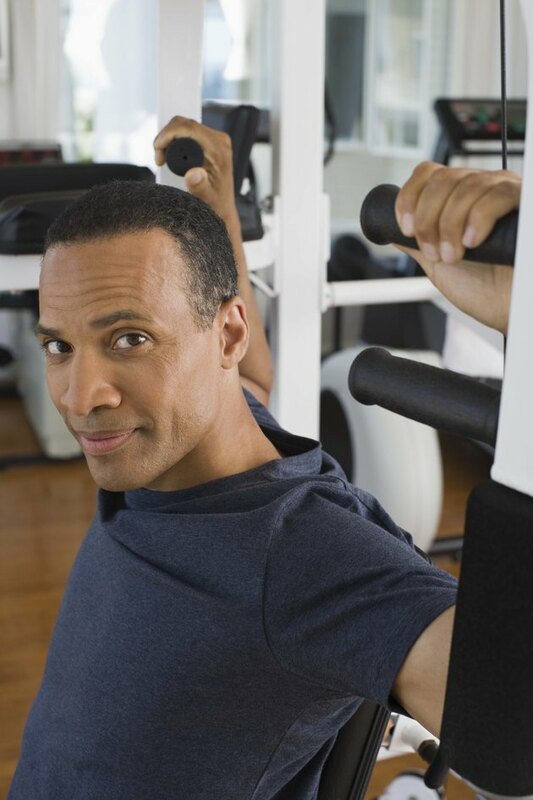 For each workout, you select two to five exercises for each muscle group you are working. As an example, you may perform the bench press, chest fly, shoulder press and deltoid row for your chest and shoulders on Monday. Then on Tuesday you may try the lat rows, narrow pulldown, biceps curl, hammer grip curls and seated triceps extensions for your back and arms. On your third day of exercise, you would then complete your routine the leg extension, leg curl, leg press and abdominal exercises for your lower body. Perform each exercise for two to four sets of eight to 12 repetitions. The compact nature of a Bowflex gym allows you to quickly switch between exercises without sacrificing form. Circuit training workouts on the Bowflex help you do this by having you select five exercises, each targeting a different muscle group. You then perform each exercise for a single set of eight to 12 repetitions. A sample routine would be bench press, leg extension, standing lat row, biceps curl and standing trunk rotation. Once you complete each exercise, take a brief rest and then repeat the cycle of exercises -- called a circuit -- up to two more times. You may perform this type of workout two or three times per week to get both strength training and aerobic benefits. Rice University: Free Weights or Machines?